Customer Contact CentersConservation Services Group, Inc.
From coast to coast, CSG is in touch and connected, and we’re listening. CSG offers premier customer contact centers to complement our clients’ full-service program delivery. With state-of-the-art telephony/call center technology and knowledgeable customer-care professionals, CSG increases program success with unmatched customer service. 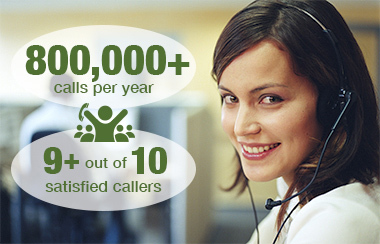 CSG’s contact centers boast exceptionally high customer satisfaction ratings. We regularly exceed client Key Performance Indicator (KPI) requirements. Our answer rates are above industry standards. Your customers receive attentive service by Customer Service Representatives (CSRs) who understand program intricacies. Our CSRs skillfully guide customers to participate in programs and move ahead with energy efficiency improvements. CSG operates six contact centers around the U.S., serving all sizes of clients and customers. Each center provides a local sound and feel to align with client and customer expectations. Regional centers provide local program support in all time zones. Every CSR completes extensive client-specific training before answering a call and is required to continuously meet service levels and performance standards. CSG’s contact center management team is committed to bringing you the highest quality of customer service. Our management team has extensive energy efficiency industry experience. This experience translates to a consistent approach to customer service and results in positive customer satisfaction.